Mohammed has lived and worked in France for forty years. But the thought of his imminent retirement unnerves him. When “the crutches of his old routines”, working in an automobile factory, are taken away from him, Mohammed finds himself floundering, cut loose from everything he has ever known. Suddenly life without work has no meaning: “Nothing of France had found a place in his heart or his soul”. Illiterate, he understands French but has never used it. Taher Ben Jelloun’s award winning book, This Blinding Absence of Light, was a searing account of the desert camps in which King Hassan II of Morocco interned his political enemies. 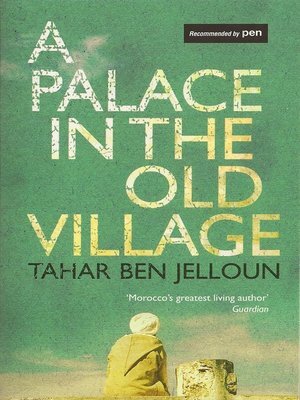 A Palace in the Old Village is a slighter novel, but no less powerful in its evocation of the Moroccan migrant experience. With remarkable economy (lucidly translated by Linda Coverdale), Ben Jelloun traces the life of a god-fearing man, “for whom Islam was more than a religion: it was a code of ethics, a culture, an identity.” His anger and sadness stem from his lack of authority and inability to teach his “assimilated” children the value of Islam and his native country’s traditions. As well as describing the migrant experience – the racism and prejudices that have to be endured and the yearning for home – this is a poignant account of growing old. Mohammed’s tolerant nature and weary resignation is also his undoing. His realisation that his life is almost over and he has nothing to show for it terrifies him. Mohammed’s feelings of dislocation grow as he watches his friend Brahim die alone and unloved: “so much loneliness, ingratitude and silence left him speechless”. Mohammed begins to plan a “grand project” to keep him occupied. He decides to return to Morocco to build a palatial home in the hope that his family – most of them married and dispersed around France – will return and share his final years with him. He tries to quell his fears of a meaningless retirement with a “stubborn dream” that is both impractical and absurd. Ultimately, though, it spurs him into action, and so he sinks his savings into constructing the biggest house in the village – “a poor man’s palace”. Ben Jelloun has created an affecting portrait of an immigrant Everyman. In the lyrical ending, in which dreams and reality collide, one senses that despite all the pain and sadness Mohammed’s homecoming finally brings him a kind of peace. It does not generally do to reveal the ending of a novel under review. But when the entire work concerns the ending to which we all come, then surely it is fair to reveal that here is a personal revelation of "the great unmentionable". Tahar Ben Jelloun's considerable body of work has followed the life-cycle in dealing with childhood, sexuality, industrial labour, unemployment, marriage and the family, all narrated in the informal vernacular of an immigrant from North Africa to either Spain or France. Here he deals with "coming home" in the dual sense of returning to "the old village" (in Morocco) and to the world before and after life on earth. As Mohammed retires from a lifetime of employment, he decides: "I wouldn't like to leave my body in a French hole. It's foolish, what I'm saying, but if I could be certain that my children would often visit my grave... I'd give my body to Lalla LaFrance". It is his uncertainty that settles the matter. "Mohammed dreamed of bringing everyone back together and having a celebration, but since he was sure his children wouldn't come, he decided to fall ill, gravely ill." When this ruse fails, he determines to sink his life's savings into digging a hole in the Moroccan desert from which would grow "the palace" that would unite the family and serve as his memorial. To him it becomes a folly on the scale of an Alhambra, forever unfinished and a monument to his unexpressed creativity. To the villagers, it is a testament to his sanctity. In returning to his roots, Mohammed is cutting down the tree of his life, shedding the branches of his family. The generation clash is also a culture clash, for the French-born children are grown and flown, marrying out and caring little for their father's traditional world-view. This has to be Mohammed's mausoleum, cursed by both his descendants and the Jinns of antiquity. Finally, "All had become simple, limpid: whatever or whomever he was dying for had fallen down the well of his childhood; he no longer saw them... no longer heard the sound of their voices". The narrative voice fuses with that of the protagonist. Mohammed – another name for everyman – is drawn from the popular classes and so becomes their spokesman. Yet he understands less than ever before about where he has come from and returned to, while it all – himself included - slips into the desert sands. "Someone cried out, Gone! Mohammed has gone to God! The village has its saint!... An old woman sitting on a stone spoke up: Wonderful! We haven't any water, we haven't any wheat, we haven't any electricity, but we have a saint!" Appropriately enough, a saint (or marabout) is described as both a holy man and as his shrine. In sacrificing his work, savings and life to his land and family, with whom his religion is so identified, Mohammed is seen as crazy and committed enough to qualify. Linda Coverdale provides a translation that lives inside Mohammed's head and a connecting voice that is fully convincing. She also provides a useful glossary to elucidate the layering of foreign and domestic, Moroccan and French, Arab and European culture. It is a minor quibble that, as ever, occasional Americanisms jump out ("friends who've done zip" and "people who don't know spit"). Ben Jelloun completes the life cycle with an extended meditation on its final stage, part tragic and part farcical, altogether moving and profound.